One day during the spring of 2016, I was working in the upper field near our gate, when I began to notice birdsong that seemed both familiar and different from the calls I was used to hearing. From somewhere nearby came repeated clicking, chirping, and other animated short calls; all mixed together. I stopped what I was doing and searched the sky to learn what kinds of birds were making such a hubbub. Right away I saw that a half dozen purple martins had moved into an old broken down birdhouse that a previous owner had installed on the easement road along our western boundary. The old birdhouse had sat empty there for several years, until last spring, when it was finally discovered by purple martin scouts, and soon the whole family had moved in! 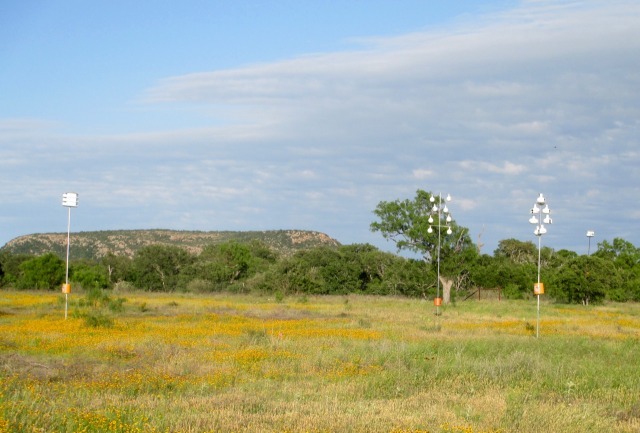 We had been told that southwest Llano County was on the western edge of the martin’s range, so we hadn’t monitored the house closely, or even performed basic maintenance (such as removing sparrow’s and other interloper’s nests). Nonetheless, suddenly here they were, and we were thrilled. Inspired by these surprise visitors, Jack began an ambitious purple martin housing development program last winter. First, he took down the ramshackle “apartment” house, refurbished it, and moved it to the bare, open field in front of our house. Next, he added several more housing types, each on a separate pole: a cheap starter-gourd complex, a deluxe condominium, and a high-end gourd complex. Counting the original FEMA rehab apartments, we now we had four different housing types for the martins to choose from. At first I was worried that moving the old house from its original location would throw the martins off somehow, and they would move on to better real estate. We expected that at best, complete occupancy would take place over a period of years, as word slowly got out among other migrants. But to our surprise, all four of the birdhouse compounds were full of birds by early April 2017. 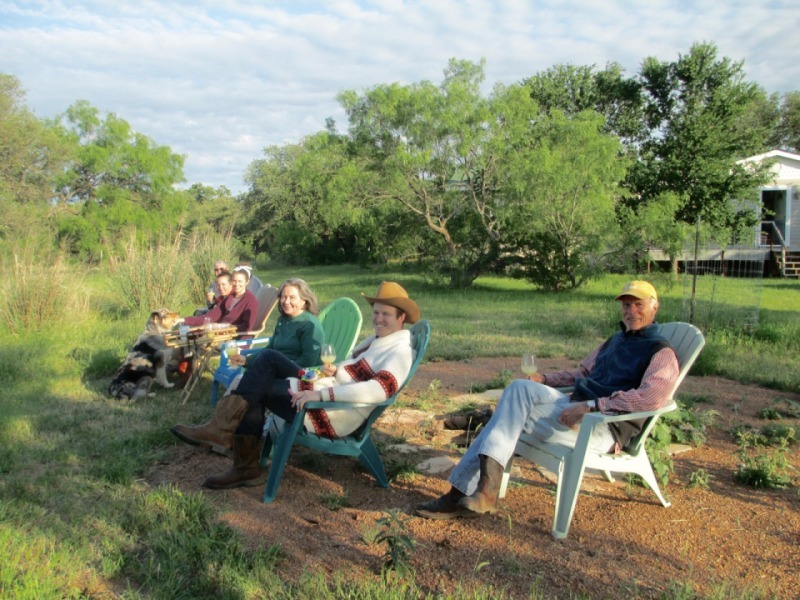 We began a new evening ritual of enjoying an adult beverage in the front yard while watching those amazing birds soar and swoop. Just like clockwork, they performed their high elevation evening hunting maneuvers way above us as the sky changed colors, until the sunset finally dimmed, and Venus rose from her daytime resting place along the southern horizon. Watching these familiar aerial hunters is somehow deeply soothing, especially against the backdrop of a broad Texas sky. Just as aquariums installed in dentist’s offices are said to calm the nervous patient, there is something about tracking the random but graceful movement of these creatures, both in groups and individuals, that turns on the Alpha waves in your brain, and invites a peaceful frame of mind. Try it, you’ll like it. The Internet is chock full of advice and information about these amazing social birds, so I won’t be repeating what you may find in more detail there. 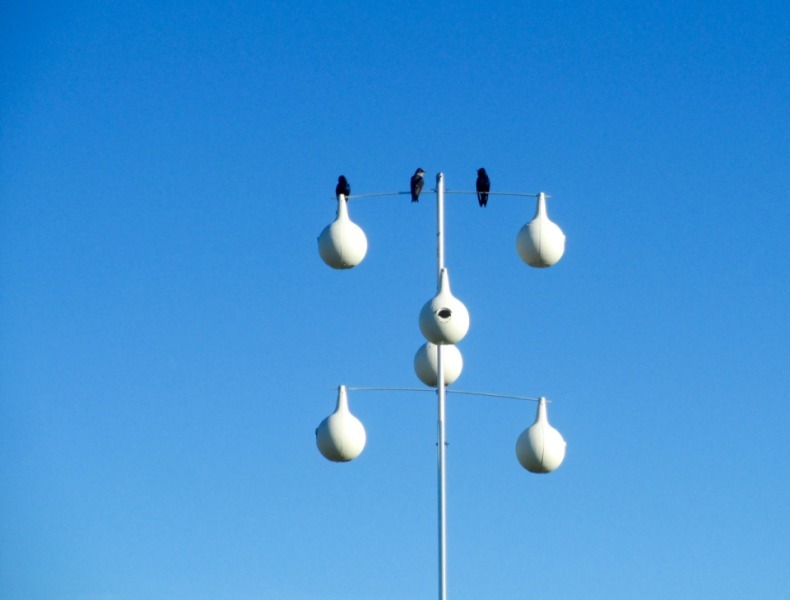 Instead, I want to explore how hosting purple martins in many ways echoes some of the actions and attitudes of committed land stewards and conservationists. A person interested in developing a strong conservation ethic begins by paying attention. She continuously asks herself, “What am I looking at?” and “What is it supposed to look like?” Close observation means you position yourself to be open to discovery, and to develop an intimate connection with Nature. At this point, it’s not about the answer, it’s about having curiosity to ask a question, especially when it challenges previous held beliefs and assumptions. Invest in yourself and your project by learning more about the topic, strategy, process, or creatures you are dealing with before you begin. Going online is a good place to start, but it can be overwhelming and misleading. I find it always worthwhile to talk with someone who has more experience and training than I do. Your teachers are out there: just be open to finding them. Although I have tried, taking short cuts rarely has paid off, or lasted. To improve the habitat, or to solve big challenges like erosion or brush management, take sweat, money, and time. 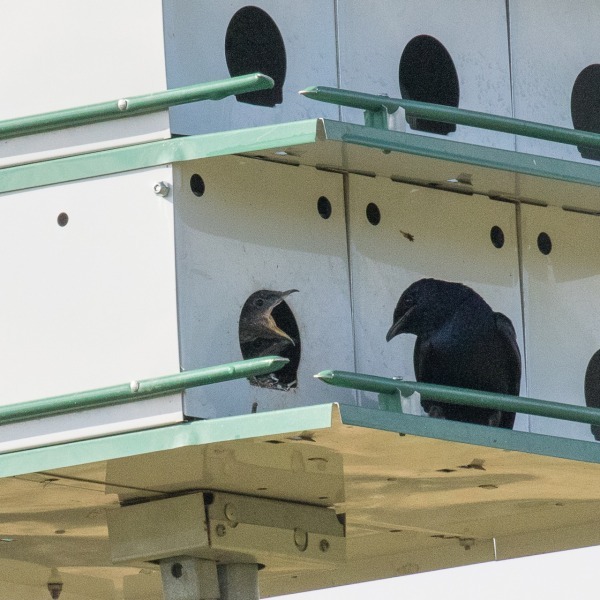 We would not have had this surge of purple martins had Jack not devoted the time to setting up the houses, figuring out practical ways to build predator guards, and so on. It’s difficult for everything to line up perfectly the first time. For a project’s goal to be durable and effective, it will be necessary to make adjustments, often due to factors beyond your control. Sadly, a storm in late April flung two-thirds of the martin houses to the ground. We discovered this a few days later, by which time the birds were soaring over at the neighbors. We didn’t know if it would be too late, but Jack put the houses back together, and later that evening, some birds returned. And so did some blasted English sparrows! Yet each day more birds did return, though not as many as the first wave. We are committed to the long term, and set backs, as my mother used to say, “come with the territory”. As time goes by, we find ourselves cycling through the list over and over: Observation: Which type houses do the birds seem to prefer?. Education: Will the birds have a second chance to fledge a new batch of babies? Commitment: we will continue to try to attract and support purple martins in the short term before their return to Brazil in August. Who knows? We may even put up more houses next spring!